Original Editors - Kevin Mooney & Erik Rice from Bellarmine University's Pathophysiology of Complex Patient Problems project. Acute Myeloid Leukemia (AML) is a type of cancer involving the blood and bone marrow. The main cell involved in this disorder is myeloid stem cells which can become either red blood cells, white blood cells, or platelets. 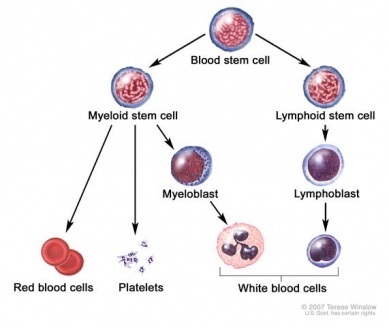 In this disorder, Myeloid stem cells become a type of immature white blood cell called myeloblasts. These myeloblasts never become healthy white blood cells. Abnormal red blood cells, white blood cells, or platelets begin to crowd in the bone marrow to prevent healthy cells from forming. Acute Myeloid Leukemia is the most common leukemia in adults, comprising 80% of adult acute leukemias. The other 20% of AML patients are children. The incidence of AML increases with each decade of life with the median age of onset at 63 years old. People over the age of 70 are 12 times more likely to develop AML. Acute Myeloid Leukemia remains a rare condition with 12,000 new cases per year. Fatigue, loss of energy, and shortness of breath upon exertion due to low red blood cell count (anemia). Older adults may experience delirium, progressive weakness, and pallor. Blood Test: Tests of patients with AML will commonly reveal increased leukocyte count initially with excessive immature cells as well as low red blood cell and platelet counts. 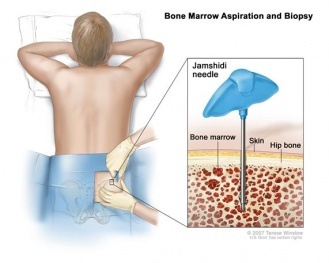 Bone marrow biopsy and aspiration: The removal of bone marrow, blood, and bone will be looked at by the pathologist under a microscope for signs of cancer. - Anemia which is accompanied by pallor, fatigue, malaise, hypoxia, and bleeding- Caused by rapidly proliferating leukocytes inhibiting formation of erythrocytes and thrombocytes. Induction- This is the first phase which clears the blood of leukemia cells and reduces the number of blasts in the bone marrow. 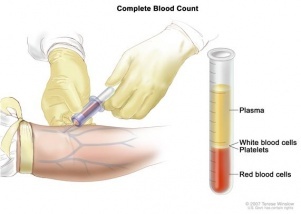 The goal is to return blood counts to a normal level over time. This should rid the body of signs of the disease for an extended period of time. Consolidation- This is administered after a rest period where the patient recovers from the induction phase. This phase is meant to kill the small number of leukemia cells that are still present. These cells cannot be seen because there are so few left after the induction phase. Maintenence- This phase is necessary in only certain types of leukemia and includes giving low doses of a chemo drug for months or years after the consolidation phase. Chemotherapy- Uses drugs to stop the gorwth of cancer cells either by killing the cells or stopping them from dividing. Chemo can be administered by mouth or injected into a vein or muscle to enter the blood stream to reach the cancer cells throughout the body (systemic chemotherapy). Chemo can also be administered directly into the Cerebrospinal fluid (intrathecal chemotherapy). This technique can be utilized when adult AML has spread or may spread to the brain or spinal cord. 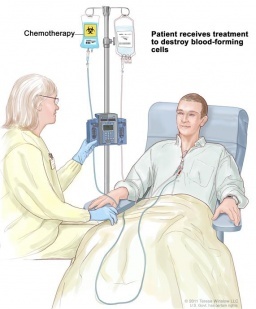 Chemotherapy can also be administered into a body cavity such as the abdomen or organ affecting only the specified region (regional chemotherapy). The way the chemotherapy is administered depends on the subtype of AML. Radiation Therapy- Uses high energy X-rays or other types of radiation to kill cancer cells or keep them from growing. There are 2 types of radiation therapy, external and internal radiation. External radiation utilizes a machine outside the body to direct radiation towards the cancer. Internal radiation uses radioactive material encapsulated in needles, seeds, wires, or catheters placed directly into the affected region. The type of radiation therapy depends on the subtype of AML. 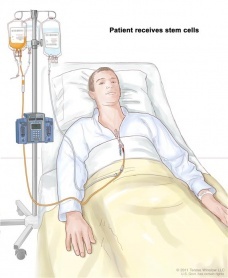 Stem Cell Transplant- Method of administering chemo and replacing blood forming cells that are affected or destroyed by the cancer treatment. 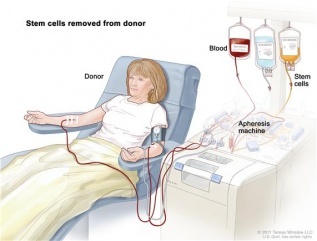 Stem cells are removed from the patients (or donors) blood or bone marrow. These cells are then frozen and stored. After chemotherapy has completed, the cells are thawed and reinfused into the patients bloodstream. These reinfused stem cells restore the body's blood cells. Targeted Therapy- Uses drugs or other substances to destroy specific cancer cells without harming the patients's normal cells. Monoclonal antibody therapy is a type of targeted therapy being studied for adult AML treatment. This therapy uses antibodies made in a laboratory from a single type of immune cell. These antibodies identify structures on cancer cells or normal substances that help cancer cells grow. The antibodies destroy, block, or prevent the cancer cells from spreading. These antibodies are administered via an infusion. They may be used alone or with other types of drugs. Pain Management- Modalities including TENS, hot packs, cold packs, massage, and positioning can be utilized in order to manage pain associated with AML treatments. Stretching- Daily stretching routines including sustained stretch, active and passive ROM, splinting, or orthotics may help offset the adverse affects of bedrest, especially contractures due to prolonged immobilization and fatigue. Stretching should be done at least 5x per week and repeated 4x for 12-15 seconds per muscle group. No exercise if patient is extremely fatigued, has low red cell counts (anemia), or has become ataxic. Avoid public areas if white blood cell counts are below 3,500 due to increased risk for infection. If patient is experiencing neuropathy be aware of increased risk of falls due to impaired sensation and pain. 2. Battaglini CL, Hackney AC, Garcia R, Groff D, Evans E, Shea T. The effects of an exercise program in leukemia patients. Integr Cancer Ther. 2009;8(2):130-8. 3. Tan SY, Poh BK, Chong HX, et al.Physical activity of pediatric patients with acute leukemia undergoing induction or consolidation chemotherapy. Leuk Res. 2013;37(1):14-20. 4. Chang PH, Lai YH, Shun SC, et al. Effects of a walking intervention on fatigue-related experiences of hospitalized acute myelogenous leukemia patients undergoing chemotherapy: a randomized controlled trial. J Pain Symptom Manage. 2008;35(5):524-34. 5. Liu RD, Chinapaw MJ, Huijgens PC, Van mechelen W. Physical exercise interventions in haematological cancer patients, feasible to conduct but effectiveness to be established: a systematic literature review. Cancer Treat Rev. 2009;35(2):185-92. ↑ 2.0 2.1 2.2 2.3 2.4 Goodman CC, Fuller KS: Pathology: implications for the physical therapist, ed 3, Philadelphia, 2009, WB Saunders. ↑ Goodman C, Snyder T. Differential Diagnosis for Physical Therapists: Screening for Referral. Saunders, St. Louis, Missouri. 5th edition. 2013. ↑ Chang PH, Lai YH, Shun SC, et al. Effects of a walking intervention on fatigue-related experiences of hospitalized acute myelogenous leukemia patients undergoing chemotherapy: a randomized controlled trial. J Pain Symptom Manage. 2008;35(5):524-34. ↑ Battaglini CL, Hackney AC, Garcia R, Groff D, Evans E, Shea T. The effects of an exercise program in leukemia patients. Integr Cancer Ther. 2009;8(2):130-8. ↑ Seiter K. Acute Myelogenous Leukemia Differential Diagnosis. Medscape. http://emedicine.medscape.com/article/197802-differential. March 9, 2012. Accessed March 18, 2014.